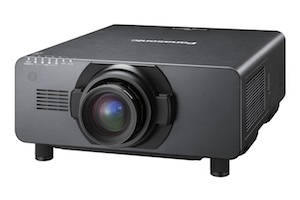 Panasonic Systems Communications Company Europe, today announced that it is developing a new portrait mode capability for the PT-DZ21K projector. The PT- DZ21K is one of Panasonic?s leading projectors with its 20,000 lm*2 of brightness in an unprecedented size and weight. The addition of portrait mode capability will allow the DZ21K to be rotated horizontally for upright images. It will also include features such as a 4-lamp system and installation flexibility with various optional lenses, geometric adjustment function*3 and network capability. The portrait mode will expand the usage of DZ21K in various applications. Detailed information and specification of portrait mode usage, and how to update current PT-DZ21K Series will be announced by 2012 Q4.